I met Gretchen Woelfle in that magical summer of 1998 when we immersed ourselves in our first residency at Vermont College. Soon after, I moved to L.A., and we spent a few memorable Saturdays strolling along Venice Beach and taking in the Pasadena museums. Gretchen is strikingly intelligent, impassioned, compassionate, a wonderful parent, and, of course, an awesome writer. Her award-winning picture book, Katje, the Windmill Cat has been a favorite of many of the children in my life. I've been privileged to read her breathtaking biographies of inspiring women: Jeannette Rankin, Mercy Otis Warren (forthcoming) and Charlotte Salomon (which had better be forthcoming!). You can read more about Gretchen at her website. I was a big reader as a kid, so naturally I became an English major. After that I took lots of jobs related to writing: copyeditor, researcher, art and travel journalism. Then I got my dream job – writing scripts for interactive multimedia educational projects. A few years later, something even better happened – I got laid off. I spent my free time perusing old family stories from nineteenth century Maine, thinking they would make good stories for children. I’d never written fiction, so I took classes at UCLA Extension, and sold several of the family stories to Cricket, Spider, and Cicada magazines. During school visits I always urge kids to record their own family stories. Those short stories got me hooked on historical fiction. Reading and traveling are two of my passions. When I mixed them up with writing, I came up with historical fiction and biography, my current interests. 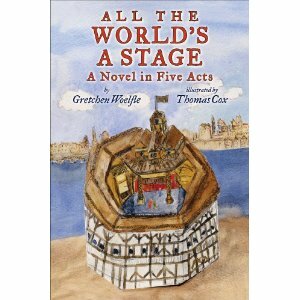 ALL THE WORLD’S A STAGE: A NOVEL IN FIVE ACTS, my latest book and first novel, began to germinate after reading a biography of Shakespeare. At that point my daughter was living in London, a city I’ve known and loved for decades, so I took several trips to visit her and do on-the spot-research for the novel. I bicycled through the City of London, interviewed the historian at the Worshipful Company of Carpenters, researched at the Guildhall Library, took a private backstage tour of the Globe Theatre, and – best of all – attended many Shakespeare plays at the selfsame Globe. Back home again, I read more and more books on Elizabethan culture, London life, and the theatrical world of Shakespeare and his cohorts. Many writing teachers tell students to write what they know, but I do the opposite. I write about what I don’t know, but am eager to learn about. And that means more reading and more travel. I'm curious about the five-act structure in ALL THE WORLD’S A STAGE and how that choice affected your writing process. If truth be told, I didn’t add the “acts and scenes” at first; I labeled them chapters. But as I revised and looked at the structure of the story, I realized I could emphasize Kit’s [my protagonist] drama by mirroring the world of the stage that he was living in. This also strengthens the metaphor of the title as well. But then the title didn’t get chosen until the book was written, sold, and edited. I guess the answer is that my writing process isn’t very logical, and reasons and motivations only appear after the fact! I'd also love to know a more about writing dialogue in a period piece and how you use your historical research to make it sound believable. I'm also wondering about the changes you make so that a present-day reader can actually follow what's happening. Aha! Here I can flaunt some of my research. I could probably not write authentic-sounding Elizabethan prose if my life depended on it, but I did read books about it. During the late 1500s English was undergoing a rapid transition to modern English. (The novel takes place in 1598-99.) For example, people (and Shakespeare) used ‘thee’ and ‘thou’ as well as the modern ‘you’ for second person singular. I used only ‘you’ to make it easier on my readers. Elizabethans used some contractions, but not others, so I was careful of that, and didn’t use “didn’t” because they did not. Other colloquialisms like ‘tis and ‘twas gave a period feel, while still being understandable. A glossary of underworld slang gave me some colorful expressions like “nip a bung” (cut [steal] a purse) and “strike a peg” (beat you up.) “Witless ninnyhammer” was the provisional title of the book at one point, which I still like, but people pointed out that no one would remember or understand it. A book of Shakespearian insults gave me some great expressions straight from the Bard, and a website for Renaissance Faire actors gave me more conversational tidbits. Though I tried to show meaning through action and context, I did add a glossary to All the World’s A Stage to make things perfectly clear. After taking some courses at UCLA Extension and attending SCBWI conferences, I sold my first book, a middle grade history of windmills: The Wind at Work. But I couldn’t get a picture book contract. Instead I got what my son called “excellent rejection letters.” You know the sort – “good story, well told, but sorry, not for us.” Vermont College had just started its MFA in Writing for Children program, and I hoped that might push me over the edge into “yes, we’ll publish it!” The MFA program offered individual work with an advisor for four semesters, along with eleven-day workshops twice a year. The program gave me so much more than I expected. The individual attention was superb, the workshops were fabulous, but the biggest and best surprise was the connection I made with my classmates – we are The Hive (four of whom blog here on teachingauthors.com). Thirteen years later we are in daily contact, thanks to email. We are not only professional colleagues with answers to any question about writing and publishing, but are now close friends. By the end of the two-year MFA program I had sold my first picture book, Katje the Windmill Cat, and was eager to share some of what I’d learned. So when I heard that UCLA Extension was hiring, I applied. I’ve taught both online and in-class courses in reading and writing children’s literature of all genres. Setting can be a great tool for a writer. In fiction or nonfiction, it adds broad context and particular details that can intensity the drama and ramp up emotional resonance. Setting can become a cliché as well – fierce argument in a rainstorm, romantic sunset walk on a beach. So I have my students write a scene that upends those clichés. A heated argument between lovers on the beach at sunset, or a love scene during a violent storm, using the details of the setting to overturn the clichés. Then I have them write the same scene in a very different setting. So you’ve got the same event in opposite settings – indoor-outdoor, quiet-noisy, beautiful-ugly, peaceful-chaotic – choosing sensory details in each setting to reflect the drama. This exercise takes students out of their heads into the environment, and also gets them to look in unexpected places for powerful storytelling. My story is a common one. First, I learned something about writing a story. Writing well is a given. There are three more essential skills though – NETWORKING, NETWORKING, and NETWORKING. We’re in luck, because children’s writers are friendly, helpful, generous people. Unlike other literary types, we are willing to share what and who we know. I’ve never been plucked from a publisher’s slush pile. Rather, all of my sales have come from personal connections. Four book sales, including my first one, came from introductions to editors by friends. Another came from my advisor at Vermont College, still another from an editor I hosted at an SCBWI event. And those sales led to more books with the same editors. I got a spot as a regular blogger on Interesting Nonfiction for Kids (inkrethink.blogspot.com) thanks to a writer friend. And I’ve tried to return the favors. So write your best beloved books, then get out there and mingle. Take classes, join a critique group, attend SCBWI events, and network! Win an autographed copy of Gretchen Woelfle’s All the World's a Stage! 3. You must post your comment by 11 pm (CST) on Wednesday, April 20th. (The winner will be announced on Thursday, April 21st.) Note: Winners automatically grant us permission to post their names here on our TeachingAuthors website. 5. You must respond to the notification e-mail and provide a mailing address within 72 hours, or the prize will be forfeited and an alternate winner will be chosen. Enjoy! And, thank you, Gretchen! I'd love to win your book first, to read myself and secondly to give to my granddaughter who is an aspiring writer as well. I'm in the middle of writing my first historical fiction about my mother's life in England during WWII. I'm learning soooo much as I research then add it to the facts my mother shared with me. It's actually theraputic. i don't have the finances to travel to England, (snif, snif) but I have several English cousins helping me. PS: I love the 5 act format. As a previous dancer and actor, this format is close to my heart. Loved the interview with Gretchen, and the exercise. It will be helpful in revisiting/revising a few scenes for my WIP about German occupation in Norway. Catching the right balance between accessible dialogue and evocative/appropriate language for the time/place is another challenge, but Gretchen's approach provides good advice. If I win I'll read it myself first, then share with several family writers in the next generation. *crossing fingers*. This book sounds wonderfully different, and I love that. Thanks, Jeanne Marie, for the excellent interview with Gretchen. It made me recall my Vermont days and the Hive. I'm excited to be returning this summer for an alumni mini residency. I'd love to win All the World's a Stage because I loved Susan Cooper's King of Shadows. I gave that book to my 13 year-old grandson, who is a budding thespian. I'm eager to see what Gretchen has done with Shakespeare, and I know Jake would like to compare the two stories. I've had the pleasure of meeting Gretchen. She's a generous person, and an inspiration! This was a great interview, full of useful information for writing historical fiction. Thanks! Renaissance England is a favorite period of history for me, and I'll be buying my own copy of Gretchen's book. But I'd love to win an autographed copy to give to a young reader as a Summer Reading prize for the Santa Monica Public Library where I work as a Youth Services Librarian. Kids who sign up for the summer reading program get prizes for reading a certain number of hours. What a terrific prize this book would be! I'm in Canada so not entering, but wanted to say thanks for the interview! I'm ordering this for our library (and one for me...cause, well, I can, lol!--um, with my own money, not the libraries!) After reading this interview I'm even more excited for the book to arrive so I can read and share.